The constellation Telescopium. Roll mouse over to see labels. Telescopium is a small and faint southern constellation which appears highest in the evening sky in the months around July. Its name is Latin for ‘telescope’, and was applied to this area of sky by Nicolas Louis de Lacaille in 1756. Lacaille originally depicted an aerial telescope – a unwieldy design of refractor which comprised of lenses attached to very long poles. 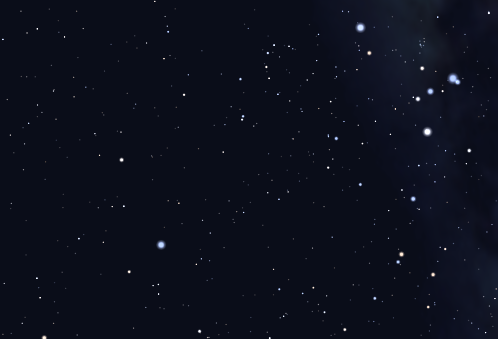 The stars which make up the telescope are of fourth magnitude, and this sky area contains only one bright deep sky object: the globular cluster NGC 6584. 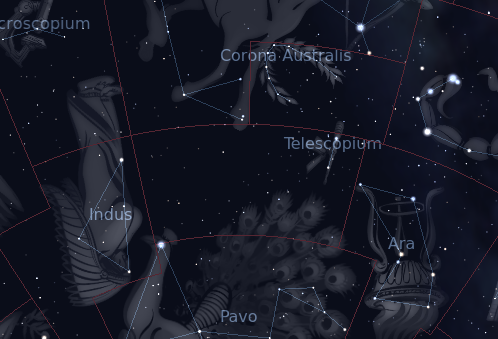 The following constellations neighbor Telescopium: Ara, Corona Australis, Indus, Microscopium, Pavo, Sagittarius.